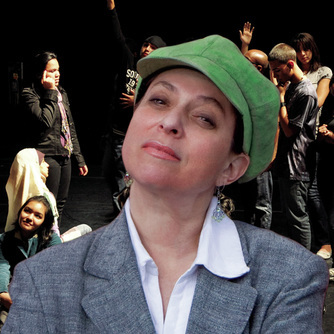 This workshop is a hands-on experience using interviewing, free-writing, and collaborative improvisation to create scripts that reflect communities. Participants will work as a group to create a poetic script and will experiment with movement and structure to complete a short performance by the end of the workshop. The exercises and tools in this workshop can be used for a variety of community building projects in addition to performance works. EarSay is an artist-driven non-profit arts organization dedicated to uncovering and portraying stories of the uncelebrated. Founded in 1999 by Warren Lehrer and Judith Sloan, our projects bridge the divide between documentary and expressive forms in books, exhibitions, on stage, in sound & electronic media. We are committed to fostering understanding across cultures, generations, gender and class, through artistic productions and education. We bring our work to theatres, museums, schools, prisons, festivals and universities. Projects include: Crossing the BLVD: strangers, neighbors, aliens in a new America (winner Brendan Gill Prize. ), Yo Miss! and 1001 Voices: A Symphony for a new America. EarSay projects have been supported by foundations and individual contributions including the Ford Foundation, the Rockefeller Foundation, the New York State Council on the Arts, the Queens Council on the Arts, the New York Department of Cultural Affairs and Viper Records.